The mandate of the National Collaborating Centre for Healthy Public Policy (NCCHPP) is to increase the expertise of public health actors across Canada in healthy public policy through the development, sharing and use of knowledge. Health authorities constitute a key group of stakeholders targeted by the knowledge translation, synthesis and exchange activities integral to the fulfillment of the Centre's mandate. 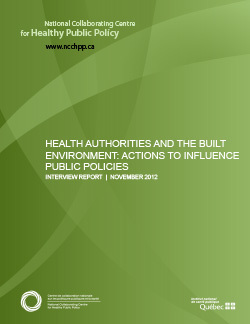 It is within this context that the NCCHPP has developed various projects tied to public policies that inform the built environment and has been working with the Healthy Canada by Design coalition. The efforts of this coalition are focused on promoting certain public policies that can lead to the creation of healthier built environments – such as transportation and urban planning policies. Under the direction of the Heart and Stroke Foundation of Canada, this coalition includes six health authorities (Vancouver Coastal Health, Vancouver Island Health, Fraser Health, Peel Public Health, Toronto Public Health, the Direction de santé publique de Montréal), the Canadian Institute of Planners and the NCCHPP. The Canadian Partnership Against Cancer (CPAC), which allocates significant resources to various projects with a primary prevention approach, is funding this coalition, along with six others, under a program known as Coalitions Linking Action and Science for Prevention (CLASP). The program is aimed at intensifying actions and promoting collaboration between actors in Canada who propose innovative, evidence-based interventions intended to act on the determinants of cancer and certain other chronic diseases. The policy-related implications of their actions. The resources available in each health authority to answer these questions varied, and the interviews thus vary in length and in the nature of their content. Among other things, the reader will find at the end of the document a conclusion written by François Gagnon. This conclusion provides an overview of the group of interviews, identifying commonalities, along with some notable features of the health authorities' experiences within the context of the CLASP project. The NCCHPP's conclusion reflects on various dimensions of public policies in an effort to bring to light some of the issues tied to the efforts undertaken by the health authorities to influence these policies. The aim of this document is to highlight the actions of the health authorities involved in the coalition and to allow for an assessment of some of their implications with respect to public policies that inform the way built environments are developed or modified. The portraits provided here are thus meant to serve not only as sources of inspiration, but also as invitations to make adjustments based on the circumstances surrounding the reader's work. François Thérien and Louis Drouin (Direction de santé publique de Montréal).